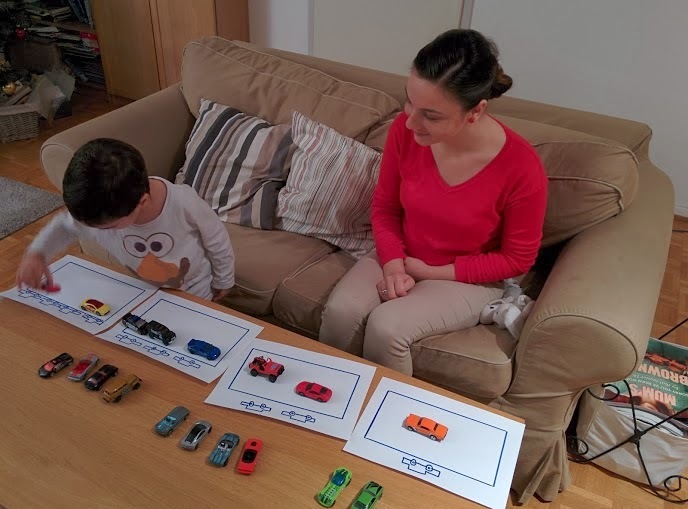 Once upon a time there was a little boy so passionate about cars that he inspired his teacher to design some special car activities just for him! Here are two of them detailed, easy to make, perfect for home or nursery settings! Direct objectives: to make correspondence between the numbers on the parking lot sheet and the numbers on the cars; to match drawn quantity with concrete material. Indirect objectives: to visually discriminate the numbers from 1 to 5, to learn and practice with concrete materials the increasing and decreasing order of numbers, to begin to make some correlations between symbols of numbers and quantity, to develop the vocabulary by naming the number symbols and learning words from everyday living, to develop a sense of responsibility by helping take and put back the materials, to develop observation skills, to develop listening skills, to concentrate, to discriminate colors; to refine the concept of "rectangular", "inside" and "outside"; to refine fine motor skills, to increase knowledge and understanding of the world by small world play, to have fun! 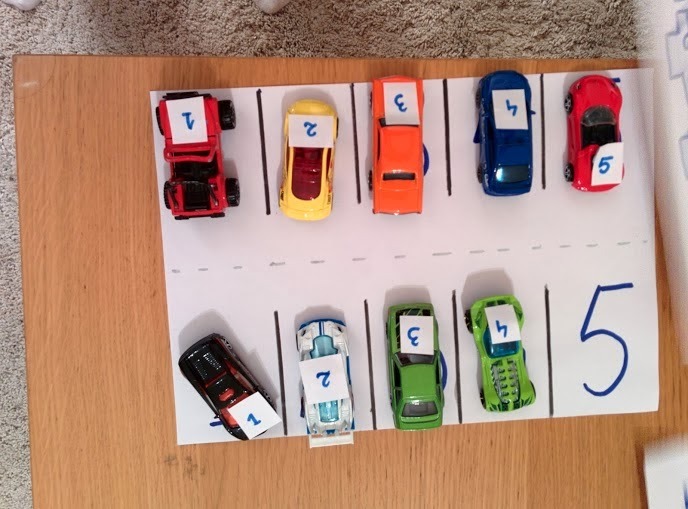 Materials – 10 mini cars of any type and colour, 1 Parking lot sheet, 2 sets of mini number cards to stick on cars from 1 to 5; blutack for sticking the mini cards on the cars. The teacher introduces the activity and the materials. 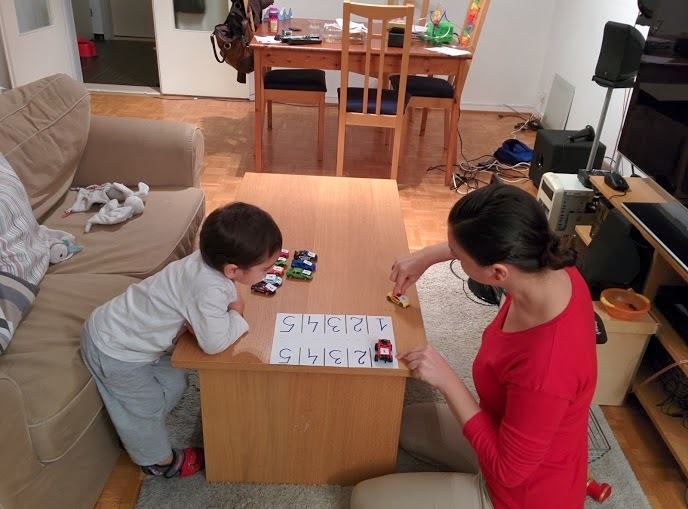 Depending on the available time, s/he may ask the child / children to help her stick the numbers to the cars. S/he introduces (if necessary) the ground rules of working with the material. 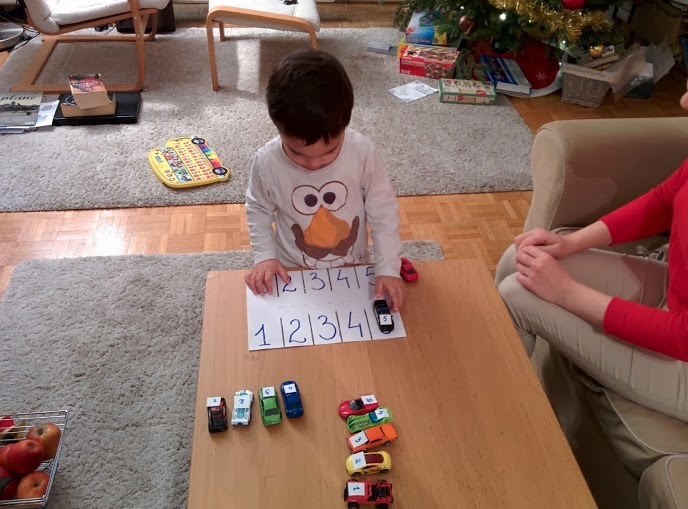 S/he uses the specific vocabulary: “This is car number one, I am searching for parking lot number 1”. 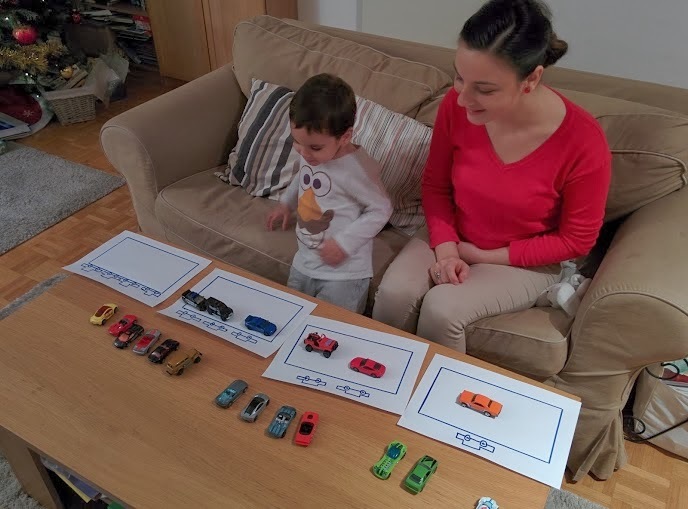 S/he invites the child(ren) to try and do the activity his/herself with the second set of 5 cars. When the activity is finished, the teacher asks if the child(ren) would like to try again on their own. At the end of the activity, make sure the child puts the materials back to their place, and thank him/her (them) for doing so. The teacher introduces the activity and the materials. 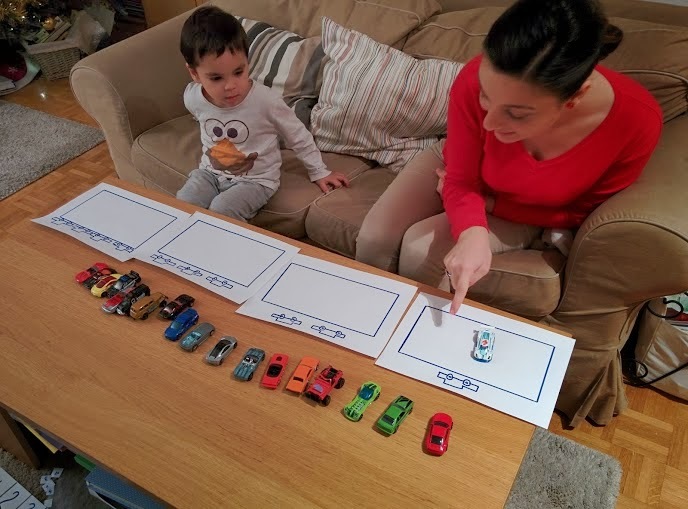 S/he uses the specific vocabulary: “There is one car drawn outside the rectangle, so I have to put one care inside it”. 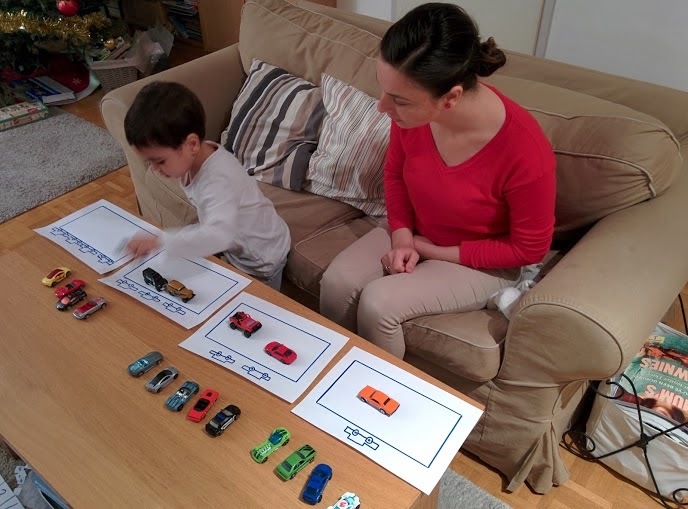 S/he invites the child(ren) to try and do the activity his/herself. I very much enjoyed working with Tudor again and although his numeracy journey is just beginning I am happy to have provided him the context to plant some little knowledge seeds for the future! I am also grateful for the openness and trust of his parents and grandparents, who really strive to provide him with the best education possible! 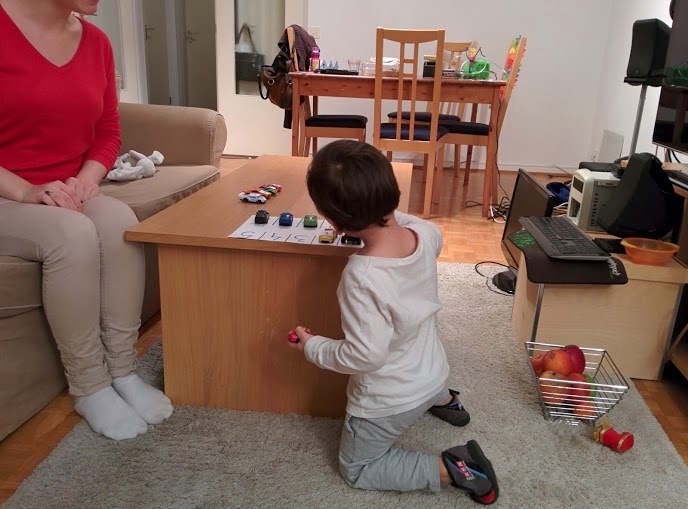 One of the greatest learning points of this lesson was the importance of following the child’s interests and always approaching him from the base of what I observe he likes and is interested / curious about. I have no clue how original these activities are, I have never done or seen them before, but I am certain that he enjoyed them because it sprung from his passion towards cars which, for Tudor, can be an endless theme for consolidating and acquiring knowledge!